BerryBush mod adds 4 kind of bushes and a new crop ! Bushes drop berries that can be eaten right away and restore little hunger. What are the Bushes and where can I find them ? Bushes are spawned all over the world ! All you need to do is run around and destroy them to collect their juicy contents. Bushes Spawn in the overworld on grass or dirt, and they do not grow ! They come in four sizes, and each size drops one of four berries. They grow all over the world ! can you spot alll 6 in this snow biome? What is the crop and how can I farm it ? Crops grow over time, and if you look close enough, you can even watch it grow !! LITERALLY !! A tiny bush-crop takes about 1 day/night cycle to fully grow ! This process can be sped up by using different kinds of ‘Fertilizing’ methods ! First and most popular fertilizing method is Bone Meal. Use bonemeal on a crop to make it grow by about 5-10 seconds ! You’ll need aproximatly a full stack of bonemeal to grow a crop from freshly planted to fully grown. Second method is rather weird, but not as expensive. The 3 blocks under the block on which the bush grows can be used as Fertilizing space ! Dirt, clay and endstone can be used to speed up the growth rate ! Here’s a few player grown bushes with harvest ready berries ! and a very cute bush-crop, freshly planted ! < +0.2 Clay can be combined with dirt ! putting endstone on the first spot will break the chain too, but will give you a whopping growth bonus ! 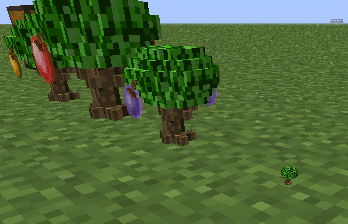 These berries are the main reason the mod was created in the first place ! The berries are made for cranking up survival mod a little bit. They restore little hunger but can be found fast and easely all over the world, making them small life savers ! They can be harvested and farmed really fast, making them a fast source of food ! 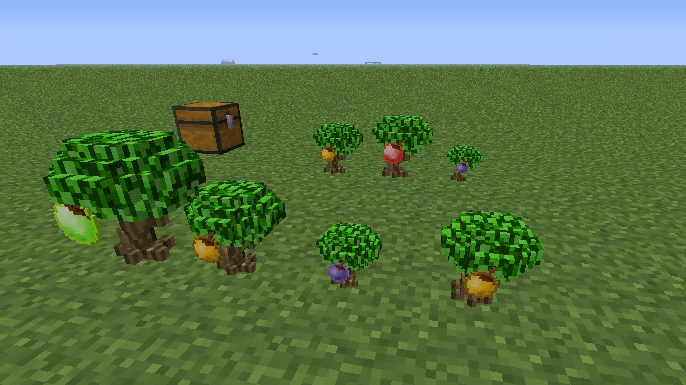 Only Juicy Berries can be used to plant Bush-Crops !